Location of Sycamore in DeKalb County, Illinois. Early in the city's history, it seemed, that Sycamore might not be the location of the DeKalb County Courthouse; other towns were vying for the county seat title. A now defunct town called Brush Point was the choice of a Dr. Henry Madden and Rufus Colton would have preferred Coltonville, where he made his home. The Clerk of the Court and preparer of the writs and process of the court, a man named Colton, had set the first session of county court to be held at his home, in Coltonville. In his attempt to make Coltonville the county seat, Colton decided to hold a new election for the status in 1837. Colton made sure that Coltonville would win the election by telling only the population of Coltonville about it. His political tactics were eventually cancelled by an act of the Illinois General Assembly, after the DeKalb County court intervened. When court convened the sheriff served a court order declaring a courthouse be built in Sycamore. Afterward, Coltonville eventually suffered the same fate as Brush Point and disappeared from the map. These events seemingly settled the issue of where the courthouse and, in turn, the DeKalb County seat was going to be located. In 1903, as the county prepared to construct a new courthouse, the debate over county seat was reignited. This time, it was the city of DeKalb that sought to wrest the title of county seat away from Sycamore. Two of DeKalb's most prominent citizens, Jacob Haish and Isaac L. Ellwood, each promised to donate $20,000 to help absorb some of the new building's cost. The city of Sycamore responded, raising funds of their own, and after some back and forth and legal wrangling, the issue was settled in Sycamore's favor. Following the end of the second county seat controversy, in 1839, the first DeKalb County Courthouse was built in the city, as well as Sycamore's first hotel. A year later the settlement consisted of 12 houses, which increased to 18 by 1844. Sycamore then began an era of steady growth marked by population increases in 1848 to 262, 1849 to 320, 1850 to 390, 1851 to 435. The Sycamore and Cortland Railroad arrived in the late 1850s and a station was erected in Sycamore. Sycamore was home to 41 commercial and industrial business by 1855. In 1858, Sycamore was incorporated as a village. Following the American Civil War the railroad began to assist Sycamore's growth and the settlement was incorporated as a city in 1869. Sycamore is the location of a notable cold case, the 1957 abduction and murder of 7-year-old Maria Ridulph. On the evening of December 3, 1957, Maria disappeared while playing outside her family's Sycamore home. She was last seen by her playmate Kathy Chapman (née Sigman) with a young man who called himself "Johnny" and had approached the girls offering them piggyback rides. A search and investigation by local and state police and the FBI failed to locate either Maria or "Johnny", and the following April, Maria's body was found in a field approximately 100 miles from Sycamore. The case remained unsolved for over 50 years until in 2011, Jack Daniel McCullough, a former neighbor of the Ridulphs, was arrested and convicted of kidnapping and murdering Maria. The case received national news coverage as the oldest cold case in US history to result in a conviction. However, in April 2016, McCullough's conviction was overturned and he was released from prison after a post-conviction review of the evidence indicated that he could not have committed the crime. On February 10, 2010, Sycamore and the surrounding areas experienced an earthquake. The shock had a moment magnitude of 3.8 and a maximum Mercalli intensity of IV (Light). It was felt 133 mi (214 km) away in Madison, Wisconsin. When the quake was first reported, it was thought Sycamore was the epicenter. However, revised data from the USGS determined the epicenter to be closer to Virgil. This was the first earthquake in Northern Illinois since a M4.2 (intensity V (Moderate)) event in 2004. Sycamore is located along Illinois Route 64 (State Street in Sycamore) about 35 miles (56 km) southeast of Rockford and 55 miles (89 km) west-northwest of Chicago. It is along the south bank of the East Branch of the South Branch Kishwaukee River in DeKalb County. According to the 2010 census, Sycamore has a total area of 9.768 square miles (25.30 km2), of which 9.73 square miles (25.20 km2) (or 99.61%) is land and 0.038 square miles (0.10 km2) (or 0.39%) is water. The terrain in Sycamore and the surrounding area is gently rolling and contains rich soil which was originally heavily forested. The commercial district of Sycamore is based on Illinois Route 64, and stretches about a mile down starting from the intersection of route 64 with Illinois Route 23 and ending at Center Cross Road. The district is composed of two-story shops, a bank, small movie theater, and The Midwest Museum of Natural History. The town also has the county courthouse, built in 1904, of limestone. In the city, the population was spread out with 28.0% under the age of 18, 8.3% from 18 to 24, 31.3% from 25 to 44, 21.5% from 45 to 64, and 10.9% who were 65 years of age or older. The median age was 35 years. For every 100 females, there were 95.7 males. For every 100 females age 18 and over, there were 93.4 males. The median income for a household in the city was $51,921, and the median income for a family was $62,083. Males had a median income of $42,676 versus $27,520 for females. The per capita income for the city was $23,112. About 2.3% of families and 3.7% of the population were below the poverty line, including 4.3% of those under age 18 and 4.6% of those age 65 or over. Sycamore has never had a large manufacturing or industrial sector. Among Sycamore's early industries were Marsh Harvester Manufacturing, R. Ellwood Manufacturing, and Sycamore Preserve Works. Marsh Harvester was established in 1859, Ellwood in 1875 and the preserve works in 1891. R. Ellwood Manufacturing relocated to DeKalb in 1891. The DeKalb County Courthouse lawn becomes a colorful display of pumpkins during the annual Sycamore Pumpkin Festival. Sycamore is home to the annual Sycamore Pumpkin Festival, a pumpkin festival established in 1962 when local resident Wally Thurow began displaying pumpkins on his front lawn. The festival features many activities, a carnival, and a parade. The lawn of the DeKalb County Courthouse is the center of the event and includes a display of decorated and carved pumpkins. The event attracts thousands to Sycamore from locations throughout northern Illinois, the Midwest, and the broader United States. The city is also home to the Sycamore Historic District, an architecturally interesting area containing over 200 individual properties. The district was established in 1978 when it was added to the National Register of Historic Places. The area is bounded in an irregular pattern along Main and Somonauk Streets but contains portions of several other streets and includes much of the downtown commercial district and residential areas north and south of downtown. During the summer, the Sycamore Historical Society offers guided walking tours with a local historian. Sycamore is also home to the Midwest Museum of Natural History, featuring a varied taxidermy collection. Sycamore features a Council-Manager government. Policy is developed by an elected City Council and then implemented by an appointed professional City Manager. The Sycamore City Council consists of a Mayor elected at-large and eight Aldermen representing one of four wards (two per ward). The Mayor and Aldermen serve four year terms, with one Alderman from each ward being elected every two years. Sycamore's current mayor is Curt Lang. Public schooling began in Sycamore as early as 1839, with classes held in the first DeKalb County Courthouse, a log building across the street from the courthouse's current location. The city's first school building was built in 1853. Current public education needs in Sycamore are provided by Sycamore Community Unit School District 427. The current Superintendent of Sycamore School District is Kathy Countryman. The district operates Sycamore High School, Sycamore Middle School, and five elementary schools. The newest elementary school, North Grove, opened in 2009 was built for access by the nearby subdivision. Reuben Ellwood Republican U.S. Representative from Illinois. (d.1885). Buried in Elmwood Cemetery. ^ "2016 U.S. Gazetteer Files". United States Census Bureau. Archived from the original on December 3, 2017. Retrieved June 30, 2017. ^ a b c d e f g h i j k l Wagner, Robert. "Sycamore Historic District Archived December 3, 2007, at the Wayback Machine," (PDF), National Register of Historic Places Inventory - Nomination Form, December 13, 1978, Illinois Historic Preservation Agency, accessed May 21, 2008. ^ a b c d Klein, Ron and McIntyre, Mac. "Looking Back at the DeKalb County Courthouse Archived September 27, 2007, at the Wayback Machine," DeKalb County Online. Retrieved May 21, 2008. ^ a b c History of DeKalb County Courthouse Archived January 3, 2007, at the Wayback Machine, 16th Judicial Circuit, 2005. Retrieved May 21, 2008. ^ O'Neill, Ann (April 15, 2016). "Judge Overturns 1957 Cold Case Murder Conviction; Jack McCullough Goes Free". Archived from the original on April 15, 2016. Retrieved April 15, 2016. ^ O'Neill, Ann (April 22, 2016). "Charges Dropped in 1957 Cold Case Murder". CNN. Archived from the original on April 22, 2016. Retrieved April 22, 2016. ^ USGS. "M3.8 - Illinois". United States Geological Survey. Archived from the original on January 12, 2018. ^ USGS. 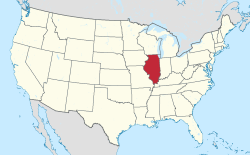 "M4.2 - Illinois". United States Geological Survey. Archived from the original on January 12, 2018. ^ a b Frillman, Carrie. "Pumpkin enthusiasts pack streets", Daily Chronicle (DeKalb, Illinois), October 28, 2007, accessed May 21, 2008. ^ McMurray, Andy. "Families travel from near and far to see Pumpkin Parade", Daily Chronicle (DeKalb, Illinois), October 30, 2006, accessed May 21, 2008. ^ Johnson, David. "Pumpkins aplent -- thousands gather for fest", Daily Chronicle (DeKalb, Illinois), October 26, 2002, accessed May 21, 2008. ^ Bigolin, Steve. "Welcome to a bright new town - Sycamore: A wealth of sites will be covered in this tour Archived May 31, 2009, at the Wayback Machine", Daily Chronicle (DeKalb, Illinois), August 14, 2006, accessed May 21, 2008. ^ Staff. "Year's last guided walking tour of the Sycamore Historic District is Sunday", Daily Chronicle (DeKalb, Illinois), August 27, 2007, accessed May 21, 2008. ^ "New leadership elected in Sycamore with Curt Lang as mayor, Mary Kalk as clerk". daily-chronicle.com. Archived from the original on December 6, 2017. Retrieved May 1, 2018. ^ "DeKalb County Courthouse Archived August 31, 2006, at the Wayback Machine", Taming the Wild Prairie Digitization Project, 2004, Northern Illinois University, accessed May 21, 2008. Wikimedia Commons has media related to Sycamore, Illinois. This page was last edited on 27 January 2019, at 05:14 (UTC).